It was the first cool day in a while at Orphans of the Storm®, but the dogs certainly didn’t mind because they all have their fur coats! 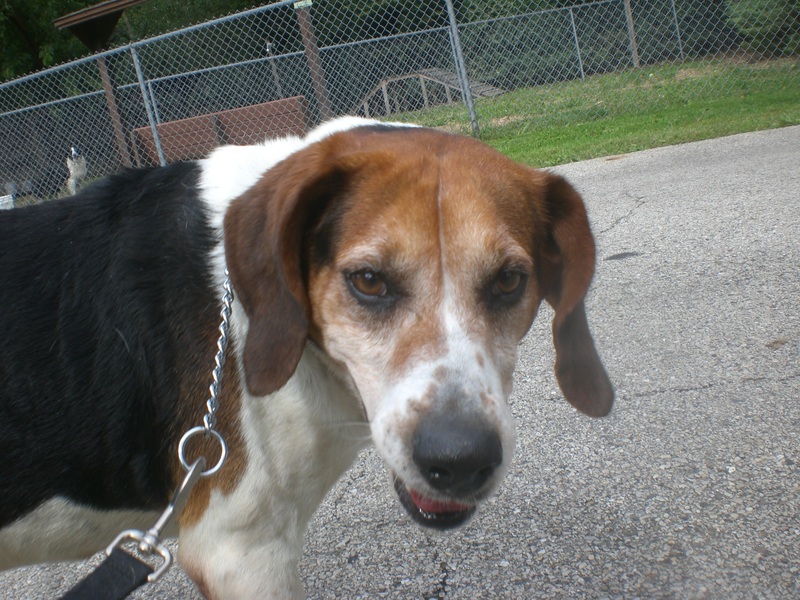 Digby the four-year-old Treeing Walker Coonhound mix is a pretty mellow guy. He’s usually snoozing in his kennel when I walk by, but he was happy to have the chance to take a walk. Since he’s so laid-back, he makes for a good walking companion because he rarely pulls on the leash. He does like to follow his nose, like any good Hound, but will stop doing that in order to cuddle with you if you kneel down next to him. Digby is what I call a leaner. When you start petting him, he will lean against your legs and maybe even attempt to sit on your lap! (Even though he’s a little big for that.) Digby was found as a stray but seems to know what it takes to be a great companion. His sweet brown eyes are clearly saying, “Let me love you.” Come by the shelter soon to see if Digby is the one for you! 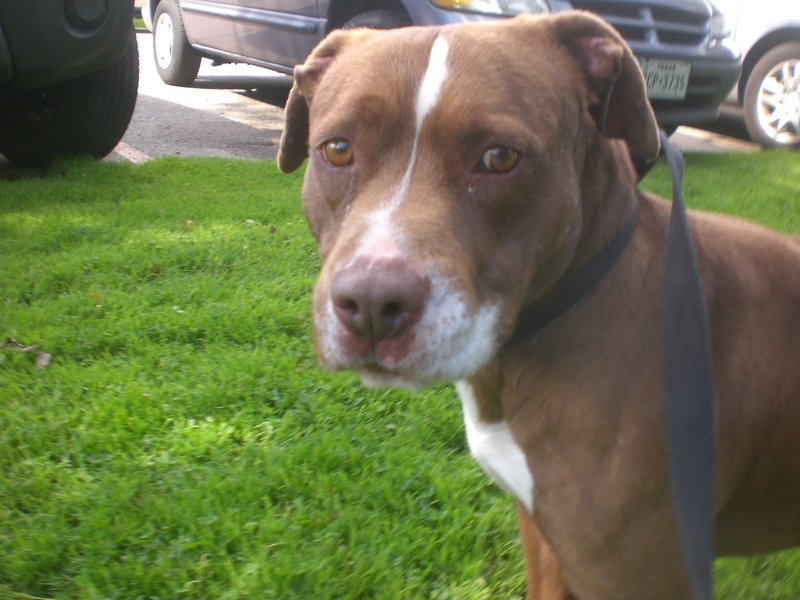 Duke the four-year-old Pit Bull Terrier mix is one handsome pooch (who actually has very similar coloring to the equally pretty Topaz). 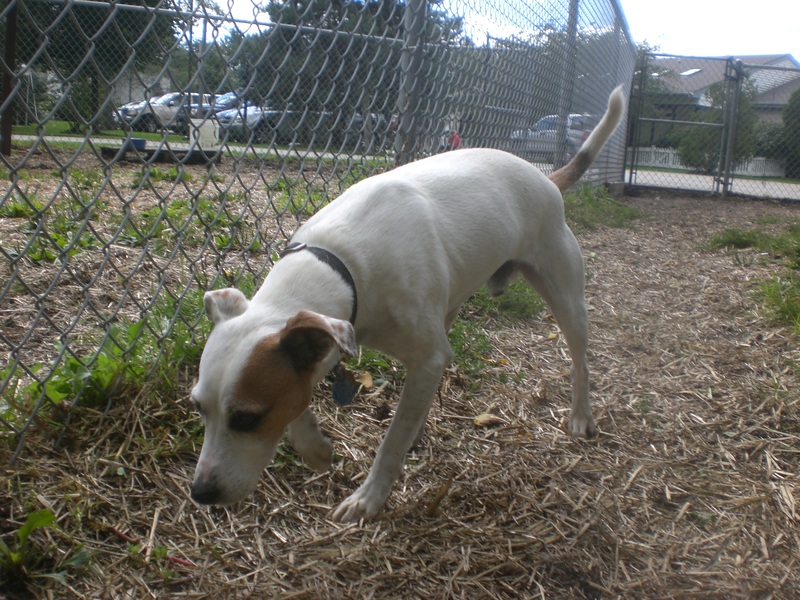 Duke is ready to greet everyone with a wagging tail. 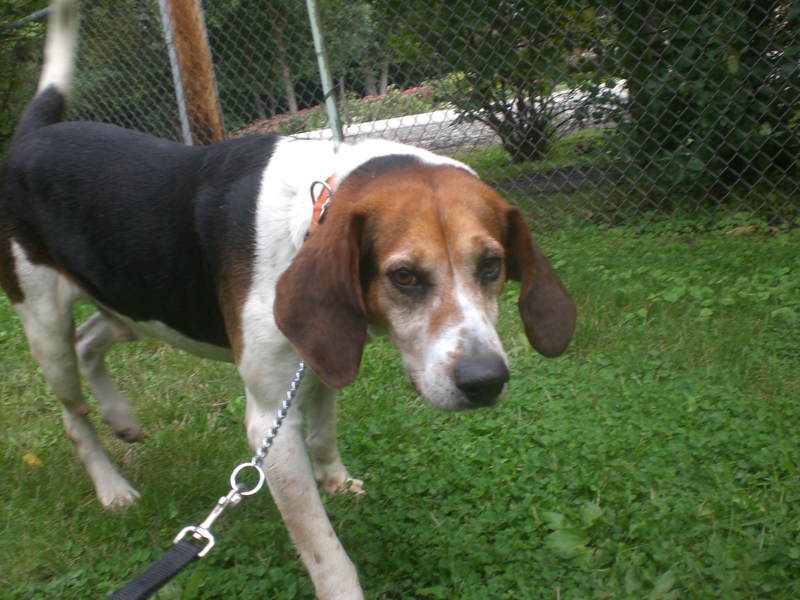 He’s a good walking buddy who would love to have an owner who can take him on nice walks every day. 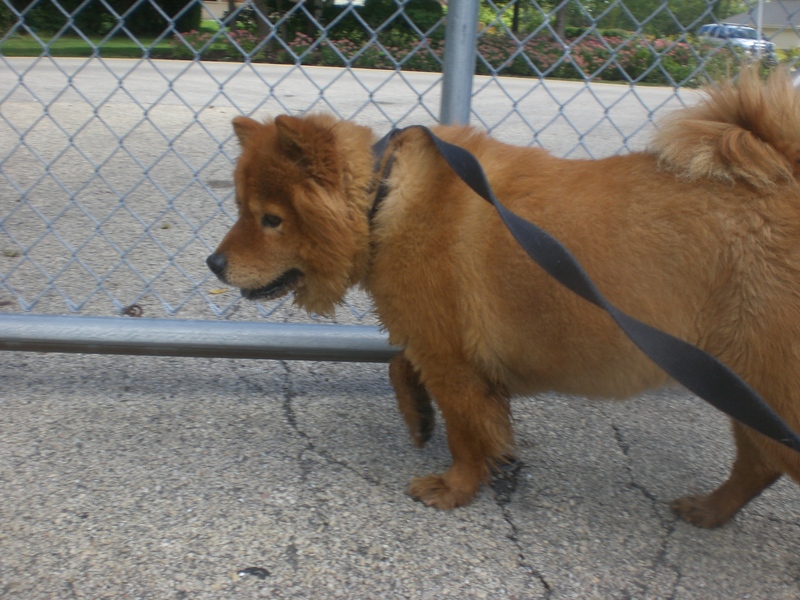 Duke had a great time exploring the off-leash run and getting the chance to stretch his legs. Duke is a very affectionate boy. At one point, he hopped up on the bench in the off-leash run. When I came over to pet him, he put his front paws on my shoulders for a big doggy hug and covered my face with doggy kisses, with his tail wagging like crazy. Duke is the kind of dog who thrives on human attention. He just wants to make his person happy. If you think you could be that person, come in soon to meet Duke! 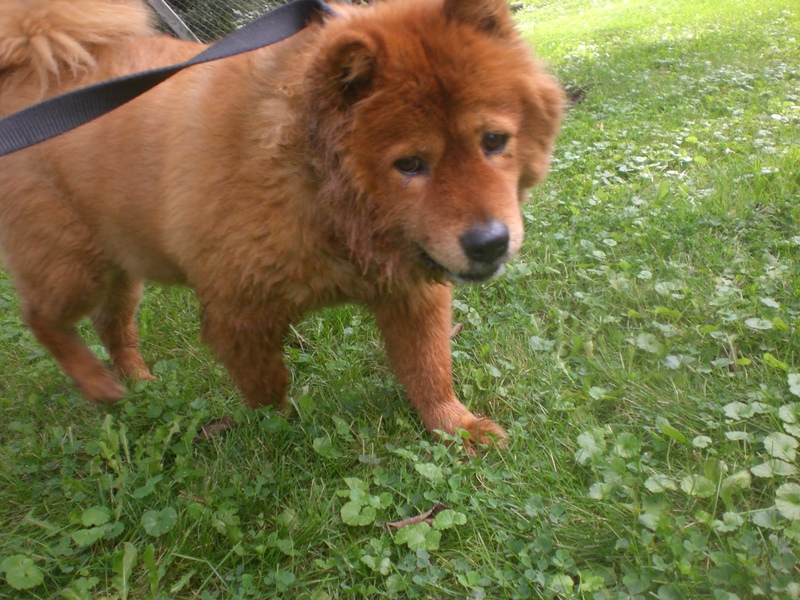 Jelly the nine-year-old Chow Chow mix has been a pet her entire life, but her owners recently got divorced and neither could take her. So now she’s at the shelter, waiting for a new family to find her. Jelly is super-duper fluffy, with some of the softest fur you’ll find. One person that we passed while we were on our walk said, “It’s a teddy bear!”, which is a pretty accurate description of how adorable Jelly is. Jelly, having years of experience as a pet, is an excellent walking buddy; she didn’t pull on the leash once. 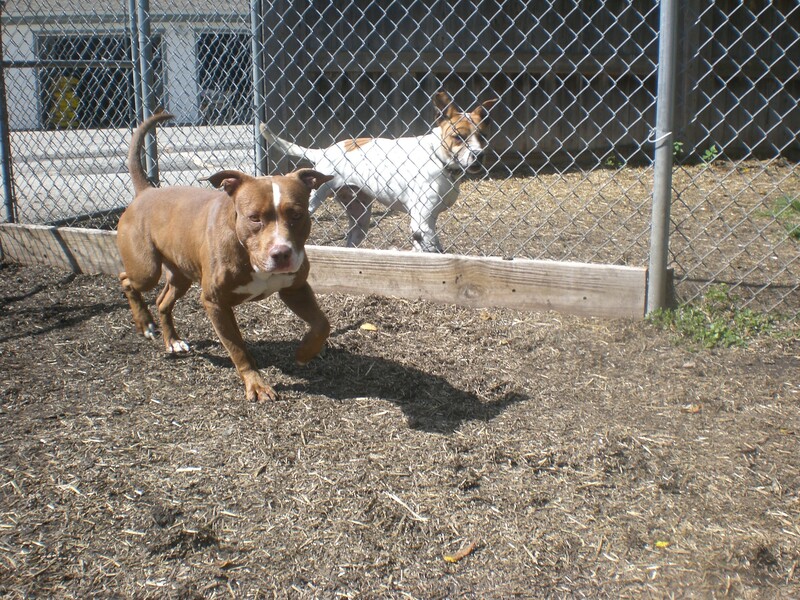 She’s currently sharing her kennel with another dog, so we know that she is dog-friendly. Jelly didn’t do anything wrong to end up at the shelter, so she’s hoping that she’ll be out of there and in a new, loving home soon. If you think that loving home could be yours, stop by soon and meet Jelly! Scooter the six-year-old Jack Russell Terrier mix is a little cutie. If you were a fan of Wishbone (as I most certainly was), you will quickly notice that Scooter could almost be Wishbone’s twin! Scooter seems energetic inside his kennel, but he was very easy-going when we were out on our walk. Scooter would do best as the only dog in his new home and, being a Terrier, would like to have an owner who can keep him busy by teaching this middle-aged dog some new tricks! Scooter was a little on the shy side when we first got to the off-leash run. He started by tentatively sniffing my leg, then my hand–but before I knew it, Scooter was in my lap! He only needed a couple short minutes to warm up to this stranger. After that, we had an enjoyable time sitting on the bench together. If you’re looking for a new, fun cuddle-buddy, come to the shelter soon and say hello to Scooter! I also saw Abby (who sat in my lap like the lovebug she is), Shard, Tom-Tom (who gives the biggest and best doggy hugs), Corky, Benny (who is just so gentle), and Shasta. And don’t forget to sign up and start fundraising for the Pooch Parade on October 18! 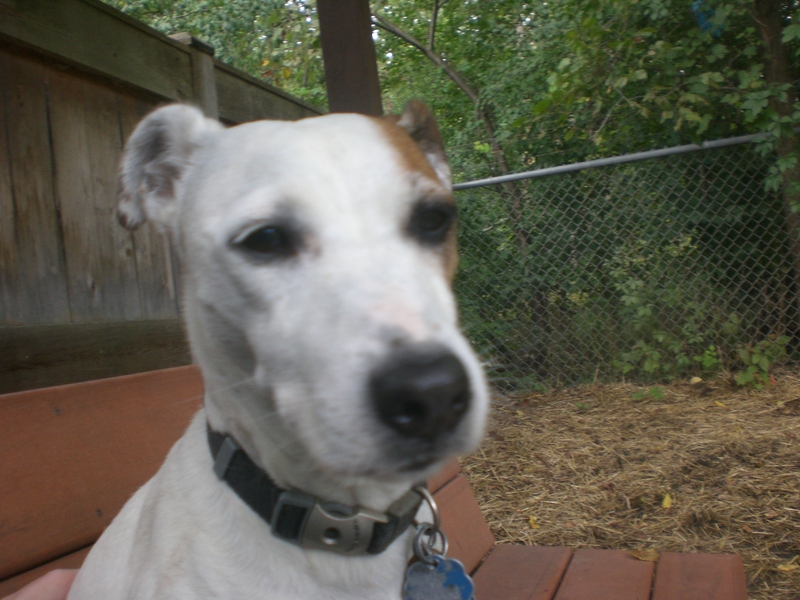 Posted by Meet the Pooches on September 18, 2014 in Dog Profiles and tagged adopt, animal shelter, animals, Chicago, Chow Chow, dogs, Jack Russell Terrier, Orphans of the Storm, pets, Pit Bull Terrier, Treeing Walker Coonhound.